Here, is expressed in radians per year, and in astronomical units. These equations, which are valid up to first order in small quantities (i.e., and ), illustrate how a planet's six orbital elements-- , , , , , and --can be used to determine its approximate position relative to the Sun as a function of time. The planet reaches its perihelion point when the mean ecliptic longitude, , becomes equal to the longitude of the perihelion, . Likewise, the planet reaches its aphelion point when . 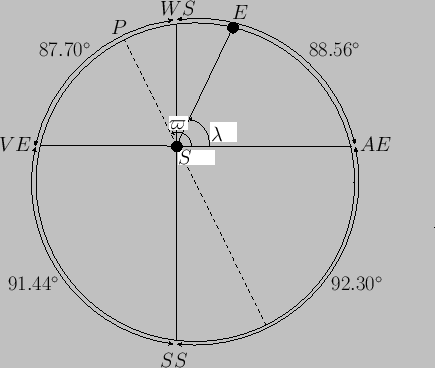 Furthermore, the ascending node corresponds to , and the point of furthest angular distance north of the ecliptic plane (at which ) corresponds to . Consider the Earth's orbit about the Sun. As has already been mentioned, ecliptic longitude is measured relative to a point on the ecliptic circle--the circular path that the Sun appears to trace out against the backdrop of the stars--known as the vernal equinox. When the Sun reaches the vernal equinox, which it does every year on about March 20, day and night are equally long everywhere on the Earth (because the Sun lies in the Earth's equatorial plane). Likewise, when the Sun reaches the opposite point on the ecliptic circle, known as the autumnal equinox, which it does every year on about September 22, day and night are again equally long everywhere on the Earth. The points on the ecliptic circle half way (in an angular sense) between the equinoxes are known as the solstices. When the Sun reaches the summer solstice, which it does every year on about June 21, this marks the longest day in the Earth's northern hemisphere, and the shortest day in the southern hemisphere. Likewise, when the Sun reaches the winter solstice, which it does every year on about December 21, this marks the shortest day in the Earth's northern hemisphere and the longest day in the southern hemisphere. The period between (the Sun reaching) the vernal equinox and the summer solstice is known as spring, that between the summer solstice and the autumnal equinox as summer, that between the autumnal equinox and the winter solstice as autumn, and that between the winter solstice and the next vernal equinox as winter. (See Figure 4.7.) Given that the length of a tropical year (i.e., the mean period between successive vernal equinoxes) is days (Yoder 1995), we deduce that spring, summer, autumn, and winter last , , , and days, respectively. (In an ordinary year, the canonical dates for the vernal equinox, summer solstice, autumnal equinox, and winter solstice--March 20, June 21, September 22, and December 21, respectively--imply that spring, summer, autumn, and winter last 93, 93, 90, and 89 days, respectively, which accords well with our calculation.) Clearly, although the deviations of the Earth's orbit from a uniform circular orbit that is concentric with the Sun seem relatively small they are still large enough to cause a noticeable difference between the lengths of the various seasons. The preceding calculation was used, in reverse, by ancient Greek astronomers, such as Hipparchus, to determine the eccentricity, and the longitude of the perigee, of the Sun's apparent orbit about the Earth from the observed lengths of the seasons (Evans 1998). Figure: A schematic diagram showing the orbit of the Earth, , about the Sun, , as well as the vernal equinox ( ), summer solstice ( ), autumn equinox ( ), and winter solstice ( ). Here, is the Earth's ecliptic longitude, and the longitude of its perihelion ( ).